Michael Rinzler, co-founder of Wicked Cool Toys, debuting the Girl Scouts Cookie Oven. Everyone loves Thin Mints and Do-si-dos, but you only get a chance to buy them from the Girl Scouts once a year. 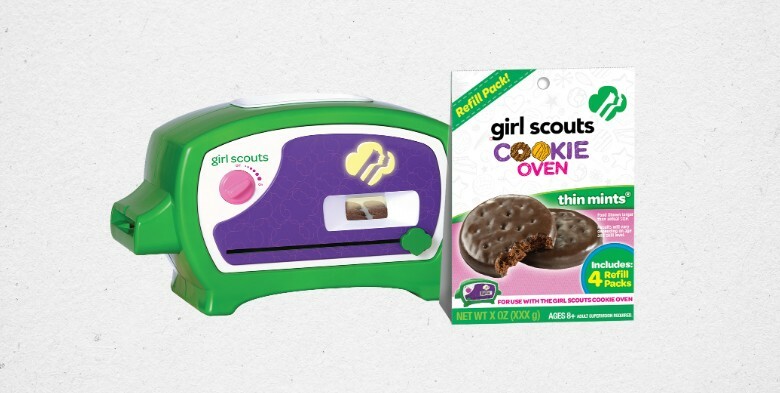 That's about to change, as a new bake-it-yourself Girl Scout cookie oven heads to Wal-Mart (WMT), Target (TGT)and Toys "R" Us stores this summer. For the first time in nearly a century, the Girl Scout organization has loosened the tight grip it has on its cookie empire to let fans bake the iconic treats themselves. It will go head to head with another iconic name: Hasbro (HAS)'s Easy-Bake Oven. 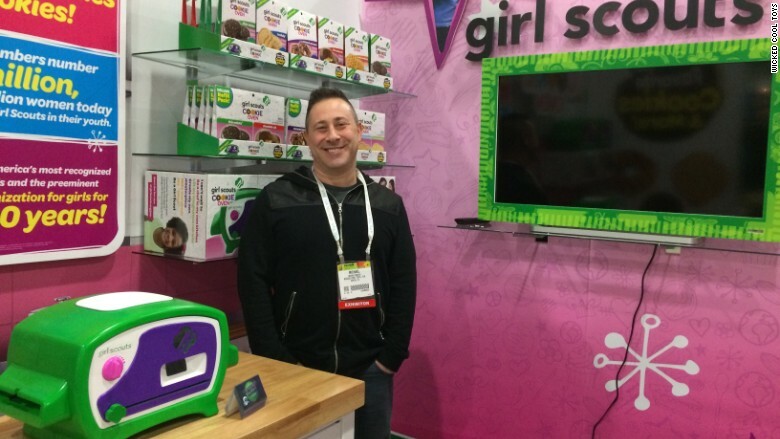 "We're excited to disrupt a toy category that's been dominated for years by one product," said Michael Rinzler, co-founder of the toy startup Wicked Cool Toys, which won a licensing deal with the Girl Scouts organization to make the oven. The Girl Scouts sell 200 million boxes of cookies a year. The oven is for kids 8 and up and will be priced at $59.99, including one cookie pack. The cookie mix packs are sold separately for $6.99 each and come in Thin Mint, Trefoil and Chocolate Peanut Butter. Kids can bake up to 6 small cookies at a time in about 15 minutes -- less than half the time of competing toy ovens, he said. "The best part is the taste," said Rinzler. "It's all the popular Girl Scouts cookie flavors." The Girl Scouts did collaborate with the toymaker, but Rinzler admits he couldn't get the exact formula of the original cookies. "So we reversed engineered the flavors," he said. "We like to say the flavors are reminiscent of the classic Girl Scout cookies and not the exactly the same." The toymaker is also making a Girl Scouts wagon and a Girl Scouts cookie stand so kids can sell cookies themselves. "A core principle of the Girl Scouts is to encourage creativity," he said. "So we don't just want to put kids in the kitchen. We want to encourage them to learn about business basics and being an entrepreneur."